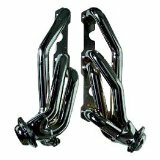 Gibson Performance Headers are the perfect solution for your vehicle! Gibson Headers are all Dyno tuned and engineered to deliver more usable horsepower and torque at low and mid-range RPM highway speeds, where you use it most! Gibson Headers Improve your engine's ability to breathe by eliminating the restrictive design of your OEM exhaust manifolds, getting the exhaust out faster. This results in improved horsepower and torque. Designed as a direct replacement for your factory manifold(s), connecting to your stock crossover pipe, Gibson Headers are easier to install. Heavy Duty Laser Cut Port Flanges- No Warping or Leaking. Premium Gaskets and Hardware included. The part number for this item is GP102 and it fits 1996-1999 Chevy C/K Series Trucks, Chevy Tahoe, Suburban (5.0 and 5.7 V8 Models w/out Air Injection w/ EGR) models. 50 State Legal. CARB EO# D-411-11. Features 1.50-inch mandrel-bent 16-gauge stainless steel mandrel bent tubing.